ABSRI’s mission is to help people thrive using insights from brain science to change how you address many of life’s challenges in order to maximize happiness in your life. Steady improvements in technology, affluence and personal freedom over the past century offer the opportunity to lead authentic lives, to discover who we truly are and to make life’s most important decisions in a way that best manifests true happiness. 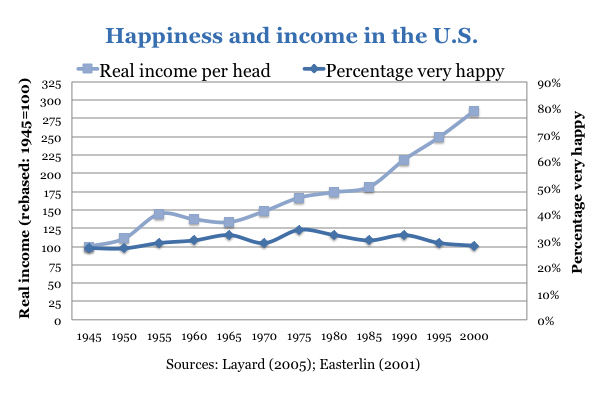 Since World War II, income per capita has tripled, but measured happiness has remained about the same. As a society, we have not converted affluence into financial security, with a majority of people, even those earning over $100,000 per year, spending more than they earn. And stress, depression, and other mental illnesses seem to be on the rise. We believe the underlying issue is the human brain and how it’s wired. From an evolutionary perspective, its focus was to survive, not thrive. As a result, our brains instinctively follow the herd. Our brains create stress even when opportunities for happiness surround us. Our brains compel us to continue collecting material possessions, which can even undermine well-being, instead of seeking meaning and purpose in life. During the past decade, there have been revolutionary advances in brain science and function. ABSRI draws on groundbreaking research in such fields as neuroscience, psychology, behavioral decision-making and behavioral economics. We use these insights to help our clients learn new skills and help them better link wealth and emotional well-being. To do so, ABSRI’s founders bring strong academic and professional qualifications to design programs based on theory and science but focused on real-word applications. Our practical exercises allow you to gain insight into your clients’ values and priorities, and provide methods for creating strategies that help you achieve their goals. Professionals, such as financial advisers, lawyers and accountants who, by enhancing their interpersonal and empathic skills and by gaining understanding into sources of personal well-being, can develop more valuable, long-term relationships with clients. We help companies and individuals channel happiness for long-term success. We define happiness as more than just a fleeting sensation—it’s an absolute state of living and working aligned with our purpose, fueled by our passion and infused with meaning in all areas of life. We believe that investing in happiness creates the foundation for a more compassionate, tolerant, integrated global society—one that works more successfully on all fronts, from families and friendships to politics and business. To do so, we synthesize the latest scientific research and academic expertise with ancient wisdom to create practical tools and relevant teachings for corporations, organizations, schools, governments and households. We all have the capability for happiness. We educate, empower and engage others to foster happiness for success. Our team lives and embodies these teachings in work, play, love and life.